YORKVILLE — Construction of a new 21-story "affordable luxury" condominium tower is expected to begin later this year on East 96th Street, according to the developer. The condos will feature a window wall system, that lets residents open and close their windows with the press of a button, 24-hour concierge service, a landscaped roof deck and indoor and outdoor recreation areas, as well as extra storage, according to Linda Alexander, a spokeswoman for the developer Wonder Works Construction. While prices have not yet been set for the apartments, brokers are recommending $1,500 to $2,300 per square foot, she said. A one-bedroom apartment condo could cost less than $800,000, she added. Average prices for a one-bedroom condo in the area is roughly $3,000 per square foot, she said. 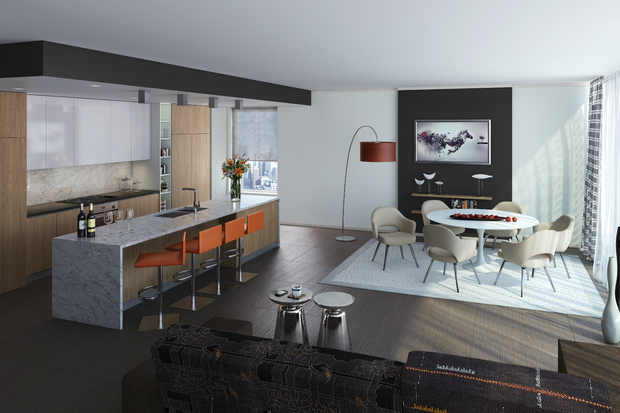 Each apartment will also include open kitchens with granite and marble counters, and integrated appliances, meaning they'll blend in with the furniture around it, Alexander said. Demolition of an existing parking garage on the property at 302 E. 96th St. near Second Avenue will begin next month and construction of the new condos will begin before the end of the year, pending approval from the city's Department of Buildings, she said. Wonder Works, which is developing the site along with Fimida Enterprises, Mink Development and Forbes Development, has gotten already approval for the demolition, according to the department's records. The project doesn't have a name yet, but it's possible that the condominium could begin taking tenants by 2018, Alexander said. The property was purchased by Wonder Works this year in March for $24 million and purchased air rights from neighboring buildings on Second Avenue, according to initial reports by The Real Deal.